Apache Struts 2 is an elegant, extensible framework for creating enterprise-ready Java web applications. The framework is designed to streamline the full development cycle, from building, to deploying, to maintaining applications over time. Apache Struts 2 was originally known as WebWork 2. 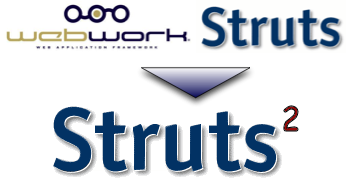 After working independently for several years, the WebWork and Struts communities joined forces to create Struts2. This new version of Struts is simpler to use and closer to how Struts was always meant to be. Easy startup - Jumpstart new projects with our bootstrap tutorial and template application or Maven archetype. Improved Design - Code clean against HTTP-independant framework interfaces. Enhanced Tags - Code less with stylesheet-driven form tags that provide their own markup. Stateful Checkboxes - Avoid special handling with smart checkboxes that know when they are toggled. Flexible Cancel Buttons - Go directly to a different action on cancel. First-class AJAX support - Add interactivity and flexibility with AJAX tags that look and feel just like standard Struts tags. Enhanced Results - Do more with speciality results for JasperReports, JFreeChart, Action chaining, and file downloading. POJO forms - No more ActionForms! Use any JavaBean to capture form input or put properties directly on an Action class. Use both binary and String properties! POJO Actions - Use any class as an Action class -- even the interface is optional! Integrated profiling - Peek inside Struts2 to find where the cycles are going! Precise Error Reporting - Flip directly to the location and line of an error. Easy-to-test Actions - Test Struts2 Actions directly, without resorting to mock HTTP objects. Intelligent Defaults - Skip obvious and redundant settings. Most framework configuration elements have a default value that we can set and forget. Say it once! Easy-to-customize controller - Customize the request handling per action, if desired. Struts2 only does what you want it to do! Integrating Debugging - Research problem reports with built-in debugging tools. Easy-to-tweak tags - Customize tag markup by editing a FreeMarker template. No need to grok the taglib API! JSP, FreeMarker, and Velocity tags are fully supported. To download the framework, visit Apache Struts Distributions. For more about Apache Struts 2, visit Getting Started. For more about framework extensions, visit the Struts 2 Plugin Registry. For help with migrating, visit our Migration Guide. An alternate set of JARs for Java 4 are also available. See the "J4" distribution. Apache Struts 2 source code and documentation is licensed to the Apache Software Foundation (ASF) under one or more contributor license agreements. See the NOTICE file included in distribution for additional information regarding copyright ownership. The ASF licenses the source code and documentation files in our Apache Struts distribution to you under the Apache License, Version 2.0 (the "License"); you may not use the Apache Struts product except in compliance with the License.